Inspiring quotes to live by and to get through the tougher times. Friends, we invite you to CONTRIBUTE YOUR FAVORITE QUOTE TO THIS PAGE. To add a quote, with the author’s name, if known, use the Comment form at the bottom of this page. "Pain is part of being alive, and we need to learn that. Pain does not last forever, nor is it necessarily unbeatable, and we need to be taught that." I think you have a thorough understanding in this matter. This is reflected in the detailed blog posts and quotes you've presented here. Thank you R.G. 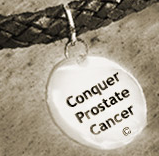 When grappling with the different aspects of prostate cancer and its treatment outcomes, It's important to provide as much insight and wisdom as possible, including appropriate humor. Excellent Blog every one can get lots of information for any topics from this blog. Nice work! Keep it up! I'm glad you find the blog posts diverse enough to meet your needs. Feel free to let us know what kind of information you value most. "There is a positive side to every situation if we simply make the choice to find it."